What is spinning? It is a great cardiovascular exercise that can help you get the body of your dreams. It is fun, addictive and entertaining at the same time. Spinning is one of the best ways to lose weight and get in shape. You can use different tension levels on a stationary bike. You should start slow and gradually increase your level. These bikes can track down your progress and show you the amount of burned calories and your heart rate. You can either go on a spinning class with an instructor or simply listen to your favorite music while spinning on your own. There are a lot of spinning video instructions that you can use while at the gym. A spinning workout lasts for 45 minutes. One training session will help you in getting rid of 500 calories. 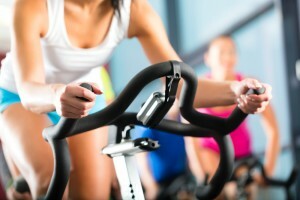 It is obvious that you will burn more calories during intense spinning classes. You can adjust your bike settings to increase/decrease the intensity. The workout will help you strengthen your core muscles, thighs and buttocks. Imagine riding your bike in the mountains, you can adjust your stationary bike to replicate similar conditions. You can decrease or increase the level of tension. It is important to stay in the right position while riding the bike, otherwise you wouldn’t get your abdominal muscles in shape. Many people think that if they pedal faster they will lose more weight – to the contrary, slow pedaling helps you in increasing the tension thus burning more calories. It will not take long for your body to change after intensive spinning exercises. Expect your leg muscles to take shape. Soon enough you will notice the strength in your hamstrings, calves and thighs. Two spinning classes every week can make miracles. Regular spinning classes will help you in improving your cardio endurance. Different pace will make your heart work harder thus increasing your heartbeat and blood circulation. You will learn how to control your breathing and lower your heart rate when needed. Heart health is an absolute benefit of spinning. If you suffer from stress and anxiety, spinning will help you combat these problems. This intense workout will exhaust your body and produce enough endorphins to make you feel better. Spinning instructor will also motivate you to do better. A combination of energetic music and nice people around you will help you forget about your stressful work. Exercising is a great stress reliever. Spinning is incredibly challenging. The program on exercise bikes is constantly changing thus making you adapt to the speed and the tension. You will be concentrated on your workout plan and will eventually lose track of time. You can watch a spinning video to keep focused on your goals and you won’t even notice how time will pass by. Alternatively you can play your favorite music, close your eyes and think.